Our Central region have played a key role in the creation of a special memorial garden close to their head offices in Coleshill, Warwickshire. 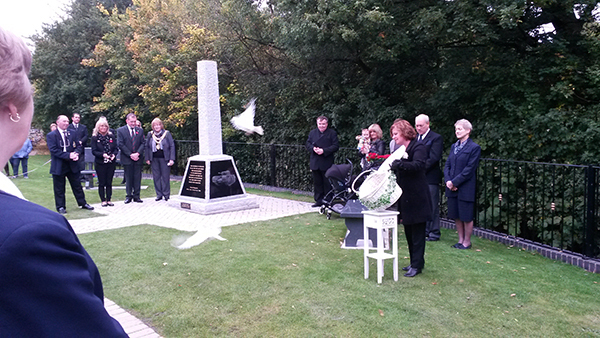 The region's fund-raising activities meant that the charity committee were able to donate more than £750 towards the cost of designing and building the Woodlands Cemetery Memorial Garden, which was opened recently by The Mayor of Solihull, Councillor Glens Slater. The garden is in memory of all servicemen and women who have lost their lives and are buried at Woodlands, and it was the memory of two brave young soldiers in particular, Joe Murphy and Robert Deering, that were behind the idea to create the garden and its memorial stone. Joe and Robert lost their lives in Afghanistan and both their families, including Joe's mum Jill Altham, who works in the Customer Care department at Central, were at the event to watch the unveiling ceremony, along with other representatives of the Armed Forces. The ceremony concluded poignantly, with the release of two white doves, representing Joe and Robert, being released into the sky.